Cranfield University is a British postgraduate and research-based public university specialising in science, engineering, technology and management. Cranfield was founded as the College of Aeronautics in 1946. Through the 1950s and 1960s, the development of many aspects of aircraft research and design led to considerable growth and diversification into other areas such as manufacturing and management. In 1967, the Cranfield School of Management was founded. In 1969, the College of Aeronautics became The Cranfield Institute of Technology incorporated by Royal Charter and gained degree awarding powers and became a university in its own right. In 1993, it adopted its current name. 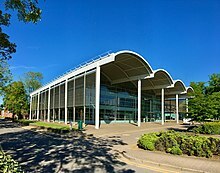 Cranfield University has two campuses: the main campus is at Cranfield, Bedfordshire, and the second is at the Defence Academy of the United Kingdom at Shrivenham, southwest Oxfordshire. The main campus is unique in the United Kingdom and Europe for having a semi-operational airport (Cranfield Airport) on campus. Cranfield University owns and operates the airport. The airport facilities are used by Cranfield University's own aircraft in the course of aerospace teaching and research. 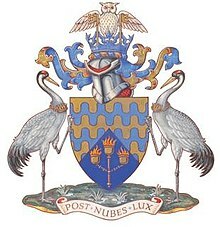 Cranfield University's motto, 'post nubes lux', means 'after clouds light'. It is depicted on the Cranfield University coat of arms which was introduced when the University was awarded its Royal Charter. Cranfield University was formed in 1946 as the College of Aeronautics, on the then Royal Air Force base of RAF Cranfield. A major role was played in the development of the college by Roxbee Cox, later Lord Kings Norton, who was appointed to be the first governor of the college in 1945 and then served as vice-chair and (from 1962) chair of the board. He led the drive for the college to diversify, with the Cranfield University School of Management being established in 1967, and petitioned successfully for a royal charter and degree awarding powers. When these were granted in 1969, he became the first chancellor of the Cranfield Institute of Technology, serving until 1997. The Cranfield Institute of Technology was incorporated by Royal Charter in 1969, giving the institution its own degree-awarding powers and making it a full university in its own right. In 1975 the National College of Agricultural Engineering, founded in 1963 at Silsoe, Bedfordshire, was merged with Cranfield and run as Silsoe College. An academic partnership with the Royal Military College of Science (RMCS) at Shrivenham was formed in 1984. RMCS, whose roots can be traced back to 1772, is now a part of the Defence Academy of the United Kingdom and now forms the Defence College of Management and Technology, known as 'DCMT' and from 2009 as "Cranfield Defence and Security". RMCS became wholly postgraduate in c.2007 with undergraduate courses moved elsewhere. In 1993 the institution's Royal Charter was amended changing its name to Cranfield University. A decade later in 2003, Cranfield became wholly postgraduate and the Shrivenham site admitted its last undergraduates. In 2009 Silsoe College was closed and its activities were relocated to the main campus at Cranfield. Cranfield campus is approximately 50 miles (80 km) north of central London and adjacent to the village of Cranfield, Bedfordshire. The nearest large towns are Milton Keynes and Bedford, the centres of which are both about 8 miles (13 km) away. Cambridge is about 30 miles (48 km) east. 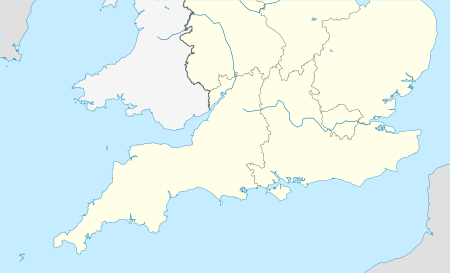 Shrivenham is about 73 miles (117 km) west of London, adjacent to Shrivenham village, 7 miles (11 km) from the centre of the nearest town, Swindon, and around 23 miles (37 km) from Oxford. The Cranfield campus sits within the Cambridge – Milton Keynes – Oxford corridor where there are plans to link these cities and stimulate economic growth. There are also plans for a tram system between Milton Keynes and Cranfield University, although this is still at an early planning stage. The Nissan Technical Centre Europe, which designs and develops cars for the European market. The NTC Europe facility occupies 19,700 square metres (0.0076 square miles) of the Technology Park, representing an investment of £46m by Nissan. Innovation Centre: the Technology Park is also the location for a large number of smaller companies. Trafficmaster plc occupied a 10-acre (40,000 m2) site for its European Headquarters. A leading company in telematics, Trafficmaster's advanced technology enables cars and roads to be used more efficiently. Cranfield Defence and Security, known as CDS, at the Defence Academy of the United Kingdom's Shrivenham site (formerly the Defence College of Management and Technology/Royal Military College of Science). Cranfield University’s specialist areas of focus, or Cranfield themes, aims to bring a range of academic disciplines together in order to tackle the grand challenges facing the world within a range of industrial and commercial sectors. These are Water, Agrifood, Energy and Power, Aerospace, Manufacturing, Transport Systems, Defence and Security and Business/Management. Within Cranfield University’s postgraduate environment, the academic disciplines work closely together, blending as they do in the commercial world and industry to deliver real world solutions. Cranfield University is in the top 1% of institutions in the world for alumni who hold CEO positions at the world's top companies according to the Centre for World University Rankings, 2017. Cranfield School of Management’s full-time one-year MBA programme was named 7th in the world and 1st in the UK and its MSc in Finance and Management was named 6th in the world and 2nd in the UK by the Times Higher Education/Wall Street Journal in 2018. Cranfield University was ranked 27th in the world for mechanical, aeronautical and manufacturing engineering by the QS World University Rankings in 2015. Cranfield has received the Queen's Anniversary Prize five times: in 2005 for Further and Higher Education for the Fellowship in Manufacturing Management (FMM) programme; in 2007 for its role in humanitarian demining; in 2011 for contribution to aviation safety through research and training in accident investigation; in 2015 for its work in water and sanitation; and in 2017 for its research and education in large-scale soil and environmental data for the sustainable use of natural resources. Students on Cranfield's Global Security programme were awarded the Imbert Prize in 2006, 2008 and 2009 for the development of ideas for the advancement of risk and security management in the UK. In 2015/16, 49% of Cranfield University's students were from the United Kingdom, 25% from Europe and 26% from the rest of the world. Cranfield University's student to staff ratio is 5:1, second among all UK universities. More than half of Cranfield University's students are over 30 years of age. Cranfield University has strong links with business, industry and governments. Cranfield University has mutually beneficial relationships with nearly 1,500 organisations around the world including small owner-managed SMEs to large multinational conglomerates; British and international universities, non-government organisations and governments. Some of Cranfield's close partnerships include Airbus, Rolls-Royce Group, Grant Thornton, BAE Systems, Boeing, Lockheed Martin, Ford, BP, British Airways, PWC, Jacobs, Metro Bank, L'Oréal, Royal Dutch Shell, Jaguar Land Rover, Oracle Corporation, PepsiCo, Unilever, to name just a few. Cranfield University has close links with more than 130 universities in the Americas, Asia and Oceania, Europe, Middle East and Africa. The University collaborates with the Singapore University of Social Sciences (SUSS) on SUSS’s BEng Aerospace Systems. 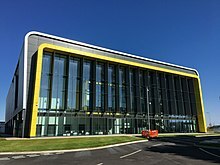 The IMRC - Innovative Manufacturing Research Centre at Cranfield University is a project funded by the EPSRC (Engineering and Physical Sciences Research Council) undertaking research that addresses issues identified in the UK government’s High Value Manufacturing strategy. Facilities at the Cranfield University campus include a sports centre, which incorporates a fitness centre and aerobics studio, playing fields, sports pitches and several tennis courts. There are wide range of shops, restaurants, cafes and bars available for students and staff. Cranfield Students Association (CSA) is the students' union and runs the main student bar, cafe and shop on the Cranfield campus. It is based in building 114 close to the centre of the campus. The CSA is run by a team of elected students and supported by a small team of staff. The aim of the CSA is to support and represent Cranfield University students, promote student welfare and organise social, cultural and sporting activities. The student newspaper is called Entropy. 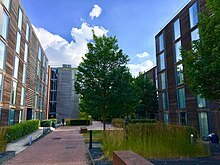 At the Cranfield University campus there are a wide range of accommodation options for full time students, from halls of residence to shared houses, apartments for couples and houses for families. For part time students, there are two options available - the 186 room Cranfield Management Development Centre and the 114 room Mitchell Hall, both of which are situated on campus. 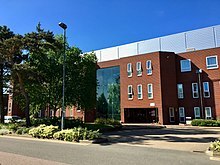 Cranfield University has a number of notable academic staff and alumni, including politicians, business people, entrepreneurs, engineers, authors, and TV personalities. ^ "The Arms of the University". Cranfield University. Retrieved 1 July 2017. ^ a b c d "Cranfield University". The Independent. 23 July 2014. Retrieved 28 December 2017. ^ "Content not found". www.cranfield.ac.uk. ^ "2016/17 Students by HE provider, level, mode and domicile" (CSV). Higher Education Statistics Agency. Retrieved 25 March 2018. ^ a b c Swain, Harriet (23 January 2012). "Is Cranfield's postgraduate-only university a model for the future?". The Guardian. Retrieved 28 December 2017. ^ "How to find us - Cranfield University at Shrivenham". Cranfield University. Retrieved 1 July 2017. ^ "Cranfield University History". Cranfield University. Retrieved 22 May 2018. ^ "History and heritage". Cranfield University. Retrieved 1 July 2017. ^ "Cranfield University". Lord Kings Norton. Cranfield University. Retrieved 1 July 2017. ^ a b "Silsoe college remembered on new homes estate". Bedford Today. 15 December 2013. Retrieved 1 July 2017. ^ "Analysis: Military redeploys intellectual might". Times Higher Education. Retrieved 26 December 2009. ^ "Cranfield Village Newsletter including a history and information on the airfield". Cranfield Parish Council. Archived from the original on 7 June 2007. ^ "Sajid Javid exclusive interview: Garden towns and expressway to sprout up in Oxbridge corridor". The Times. Retrieved 23 May 2018. ^ "National Infrastructure Commission - Cambridge, Milton Keynes and Oxford Future Planning Options Project Final Report" (PDF). National Infrastructure Commission. Retrieved 23 May 2018. ^ "Nissan UK". Nissan, UK. Retrieved 10 June 2007. ^ "Trafficmaster plc". Trafficmaster plc. Retrieved 10 June 2007. ^ "Sir John O'Reilly". Engineering and Physical Sciences Research Council, UK. Archived from the original on 7 June 2007. Retrieved 9 June 2007. ^ "Sir John O'Reilly". Cranfield University - Biography. Archived from the original on 18 July 2009. Retrieved 18 March 2009. ^ "Professor Sir Peter Gregson FREng". Cranfield University - Chief Executive and Vice-Chancellor. Retrieved 27 February 2014. ^ "Cranfield University Academic Disciplines". Cranfield University. Retrieved 22 May 2018. ^ a b c d "Cranfield University Fact and Figures". Cranfield University Fact and Figures. Retrieved 22 May 2018. ^ Cranfield University. "Times Higher Education/Wall Street Journal Rankings". ^ QS World Rankings. "QS World Rankings by Subject 2015". ^ [email protected], WebstarsLtd.com //. "Winners of the Queen's Anniversary Prizes announced". www.royalanniversarytrust.org.uk. ^ "Bedfordshire onsunday has closed". m.bedfordshire-news.co.uk. ^ "Cranfield University Rankings and Awards". Cranfield University Rankings and Awards. Retrieved 22 May 2018. ^ Sims, Brian (3 August 2006). "Burrill, Cahalane and Finch win Imbert Prizes". Info4Security. Archived from the original on 13 July 2011. Retrieved 26 June 2009. ^ "ASC lunch". Professional Security Magazine. 30 June 2008. Archived from the original on 3 October 2011. Retrieved 26 June 2009. ^ Sims, Brian (30 June 2009). "Policing with a Brain: the 2009 ASC Annual Luncheon". Info4Security. Archived from the original on 13 July 2011. Retrieved 30 June 2009. ^ "Cranfield University International Partnerships (Who we work with)". Cranfield University International Partnerships. Retrieved 22 May 2018. ^ "Cranfield University International Partnerships". Cranfield University International Partnerships. Retrieved 22 May 2018. ^ "Collaborations with Overseas Universities". SUSS. 29 May 2018. ^ "Karan Bilimoria - Founder of Cobra Beer". London Speaker Bureau. ^ "London's Most Influential People 2008". London Evening Standard. ^ "John McFarlane OBE, awarded honorary degree from Cranfield". Cranfield School of Management. Barker, Revel (1996). Field of Vision; Cranfield University: the first fifty years. Cranfield University Press. ISBN 1-871315-60-3. 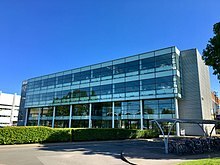 Wikimedia Commons has media related to Cranfield University.